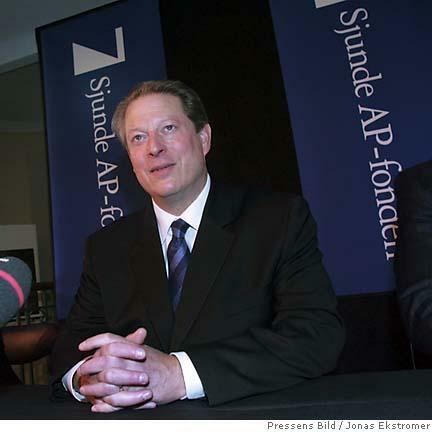 Today, Al Gore announced that he is not running for President in 2008 -- although reserved the possibility that he might run in the future. While Kos thinks this is bad news, I view this as a sigh of relief. Not to say that my impression of Gore hasn't improved since his lackluster run for President. He has been an eloquent critic of the Bush administration, including an early critique of the impending Iraq invasion, going places that most tepid mainstream Democrats refuse to tread. He endorsed Howard Dean for President. And he came to my school last June and spoke out eloquently against the use of torture. It almost makes one wonder if, after losing the election having the presidency stolen from him, Gore had a mid-life crisis and realized that he finally needed to stand for something. Personally, I think anyone who's limited their choices for 2008 candidates to Hillary Clinton and Al Gore is sorely lacking in originality, if not just flat out not paying attention. And originality is what the Democratic Party is sorely lacking right now. We have got to stop resorting to celebrity candidates, and start thinking about how do we create a progressive movement in this country that recruits new leadership, grooms them for higher office, and ensure that we always will have a deep bench of qualified candidates?? It's the same problem as when progressives in Oakland recruit Ron Dellums to run for mayor, or when Berkeley progressives took former Assemblyman Tom Bates out of retirement and had him run for mayor. Sure, running a celebrity makes the job easier -- but it doesn't really help sustain a movement. My early support in 2008 goes to Russ Feingold, notwithstanding his own set of problems. He's far and away the most progressive potential Democratic candidate out there, and after having been in the Senate for 12 years, it's about time that he gets promoted. Running Al Gore and Hillary Clinton would be running on the goodwill Democrats have generated in the past. Running someone like Russ Feingold would be looking at an eye into the future.